Are you a fan of music? I bet you are! So hunting for the best noise-cancelling wireless headphones must be a quest of your whole life. Now stop hunting because Cowin E8 Active Noise Cancelling Bluetooth Headphone is here, Unveiled at san diego tech events. This chick-style black headphone features the best noise cancellation and wireless connectivity innovations, making listening to music pleasant everywhere everywhen. Clarity and accuracy of sound is enhanced by 40mm large-aperture drivers, while the built-in mic makes answering phone calls easily with no hand holding requirement. Plus, volume is effortlessly controlled by just a few touches. 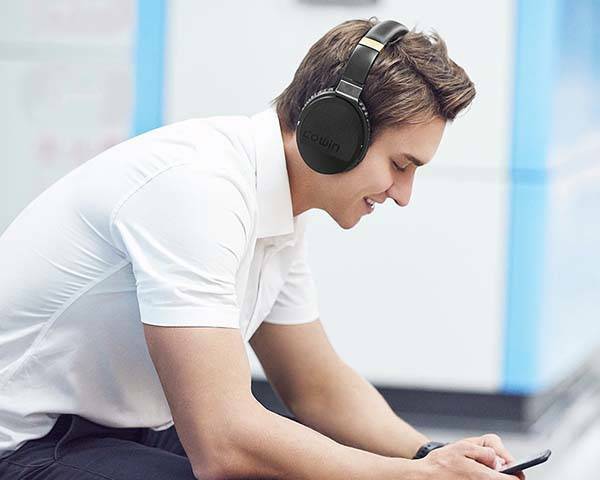 On Bluetooth mode, Cowin E-7 enables up to 30 hours of continuous music streaming. When the battery is dead, music can still be played non-stop by the included 3.5mm audio cable, so there is no wasting time of not enjoying music. Cowin E8 is a pair of high-performance ANC Bluetooth headphones that measures 6.7 x 3.7 x 8.1 inches and weighs 13.6 ounces. As we can see from the images, the on-headphones has a low-profile yet sleek appearance design. Using the foldable design and included carrying case, you can easily store the earphone in your bag for any trip. Meanwhile, using the lightweight design, adjustable headband and upgraded soft ear cushions with magnetic adsorption, the E8 delivers a custom and comfortable wearing experience for every listener. The E8 Bluetooth headphones come equipped why proprietary 40mm large-aperture drivers in order to produce high-quality wireless stereo audio. More importantly, built-in professional active noise cancelling technology helps you significantly reduce the noise from your surroundings for a more immersive listening experience. Moreover, built-in microphone lets you answer handsfree calls with ease. An integrated 545mAh rechargeable battery provides 20 hours of playtime. In addition, included audio cable allows you to use them in wire mode. Cowin E8 active noise cancelling Bluetooth headphones are priced at $149.99 USD. If you’re really interested in this Noise Cancelling Bluetooth Headphones and want to grab it, then jump to Amazon for its more details.